Do you sometimes find yourself in a place where the door doesn’t quite have enough security? Maybe you’re in a hotel room, a public bathroom that doesn’t lock up correctly, or are renting a place that doesn’t allow you to install your own locks or latches on a door, or perhaps you’re not in a position where you can afford to install one. Fret not, because as it turns out, you can fashion your own simple lock out of a dinner fork that costs 25 cents! Yes, that’s right. This video by Phil Crockett details how to do just that. 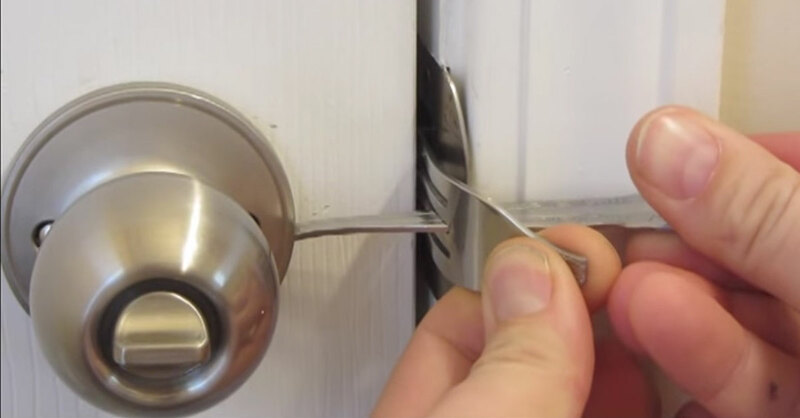 By marking the depth of the door knob’s nook, and then bending the fork at that mark with the use of a vice and a hammer, you’d already be halfway there! The next bit requires a saw or cutting device of some sort, and it requires that your fork tapers off in the handle from narrow to wide. Simply saw off the part of the handle just before the fork’s prongs, then if needed, sand it down so that the dismembered handle can fit snugly between those prongs. All that’s left is to assemble the lock on the door, and voila! An impenetrable lock that doesn’t harm the door in any way and is decently sturdy and secure given its make. You can even sand down sharp edges and bring it along when you know you’re going somewhere that may not have secure locks, and it’s cheap and easy to fashion.